A mansion house used in the classic crime film Get Carter has been put up for sale for £1.75m. Dryderdale Hall, near Hamsterley, County Durham, acted as the home of the gangster, Cyril Kinnear, in the 1970s movie, starring Michael Caine. In one scene, shot in the main lounge, Caine's character, who has returned Tyneside to avenge his brother's death, confronts Kinnear while playing cards. A memorable scene outside the hall shows a body being dragged from a pond. 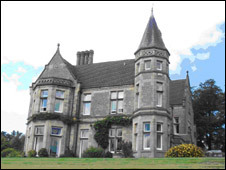 The Grade II listed hall, set in 20 acres of land, was built in 1872 for the Backhouse family, of Darlington, whose wealth was made in the banking industry. Architect Alfred Waterhouse, who designed the Natural History Museum in London, was responsible for the building's Scottish baronial style. Owners Michael and Dorothy Morley, who purchased the site in 1991, are selling the hall in order to move into a smaller property. Mr Morley said: "The interior has changed a great deal from the time of the film as there was a major fire later in the 1970s. "However, if you know the film and look closely, you can see the layout has not changed very much and obviously the exterior and grounds have not changed at all. "The Get Carter link is of interest to fans and the people of the North East but I doubt anybody is going to pay out £1.75m just because of the film." Estate agents Nick and Gordon Carver Residential believe the sale will create national and international interest.